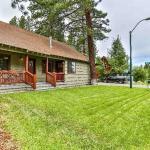 Set in South Lake Tahoe Heavenly Ski Run Cottage offers free WiFi and units fitted with a kitchen seating area and flat-screen TV. An oven and microwave are also provided as well as a coffee machine. If you would like to discover the area skiing is possible in the surroundings. Tahoe Queen is 300 metres from the holiday home while South Tahoe Ice Arena is 1.7 km from the property. The nearest airport is Reno-Tahoe International Airport 64 km from the property.